Comm Eye Health Vol. 18 No. 53 2005 pp 79. Published online 01 March 2005.
International Centre for Eye Health, London School of Hygiene and Tropical Medicine, Keppel Street , London WC1E 7HT, UK. To deliver longer acting topical medication e.g. – when an eye needs to be padded for long periods. 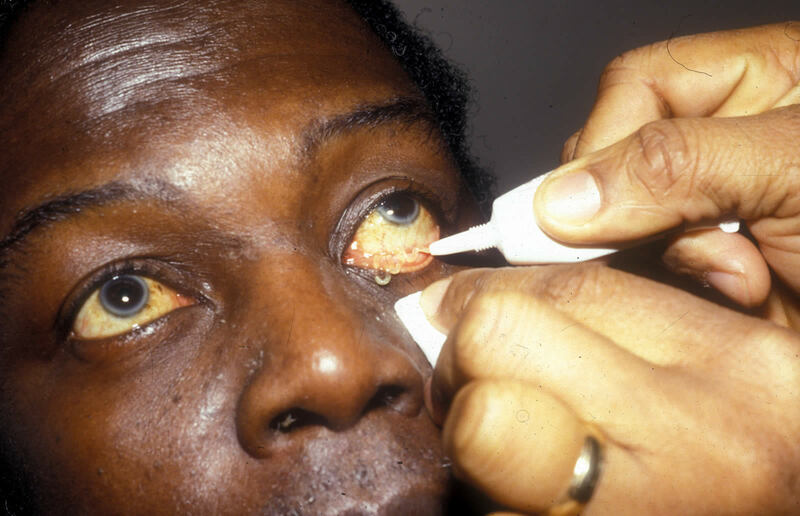 Prescribed eye ointment – produced in varying sizes and colours of tube. Check that the ointment is not date-expired. This is not always easy to read on the actual tube so be careful to take time to do this. Some tubes also come in a box where the expiry date is easier to read. Ask the patient to look up. Squeeze tube slowly to allow about one centimetre to emerge in a thin line along the inside of the lower eyelid. (Rather like putting toothpaste on a toothbrush!). Do not touch the eye with the tube nozzle! Do not touch the eyelid skin or eyelashes with the tube nozzle – it will cease to be sterile and need to be discarded. Wipe away any surplus ointment which may emerge when the patient closes the eye.